Indictment revealed against 28 year old Raf'at Halabi, who is accused of crossing into Syria and providing information on IDF. 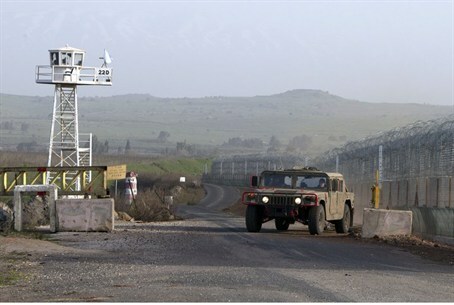 An Israeli citizen from the Druze town of Majdal Shams on the Syrian Border was arrested last month and convicted of spying for Syria, it was revealed Friday. According to the indictment filed by Northern District prosecutors, 28-year-old Raf'at Halabi had contacts with a foreign agent and crossed into Syria illegally in September. In September, Halabi crossed the border and traveled to an acquaintance's home in the Syrian town of Kafr Khadr, where he contacted the officials who recruited him against Israel. Halabi gave information about the Israel-Syria border fence, the IDF patrols along the border, and which Assad dissidents were hiding in his village. The indictment further stated that Halabi gave information about a doctor who was rumored to be treating Syria's wounded in Israel's borders. The doctor's vehicle was later set on fire, the indictment reveals. An investigation by the Shin Bet, Israel's Security Agency, revealed that Halabi crossed the border with the help of a friend, 24-year old Muhammad Rumiyyah. Rumiyyah was also charged. This is not the first time a Majdal Shams resident has been involved in spying for the Assad regime. In July 2012, Iyad Jamad Assad Juhri was arrested on allegations of spying on the IDF between 2005-2008. Juhri admitted that he met Syrian intelligence personnel in Syria and also turned over information on the names, locations and sizes of IDF bases, including information on training exercises and whether or not tanks were present. Majdal Shams has also been the site of mortar shell attacks, including one on its outskirts just this week.